He started doing video for shows and became a part of the community of artists that work regularly with the group. Who needs Realism when we can have Fakism? The individualities that form Teatro Praga (a group of artists that work without director) embrace an unrepeatable theatrical practice: they are always different, in constant metamorphosis and subjected to unpredictable variations of themselves. The group finds their difference and identity not in questions such as “What do we do? What has been done?” but in a necessity and will to live in confrontation with the answers that arise out of those questions. Our performances are happenings which, whilst maintaining the physical form of theatre (fiction), search for the “utmost responsibility of the spectator”, i.e. the chance to find a community amidst the fictional chaos. TEATRO PRAGA was formed in 1995 and is currently located at Espaço Teatro Praga, in Lisbon. 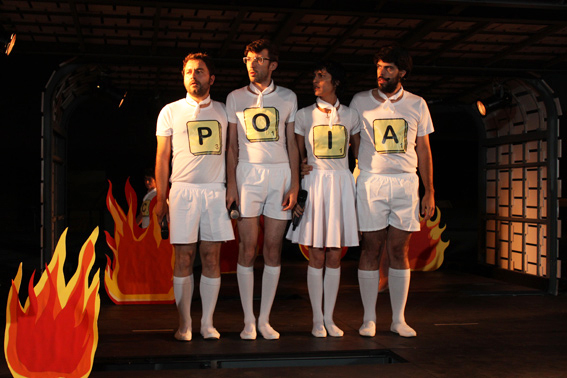 The group has been regularly creating theatre pieces co-produced by the most prestigious contemporary cultural organizations in Portugal and have performed at several festivals and events in other European countries (Italy, United Kingdom, Germany, France, Hungary, Slovenia, Estonia and Denmark).